LITTLE ROCK, Ark. - Aug. 14, 2018 - PRLog -- Drama Kids of Pulaski County announced on Tuesday that an agreement has been reached with the Little Rock School District to offer students of Henderson Middle School the opportunity to participate in and benefit from Drama Kids' unique developmental drama program during the school's fall semester. The program will allow 7th and 8th graders to participate in developmental drama classes each school day throughout the fall school session and perform in front of family and friends in December. 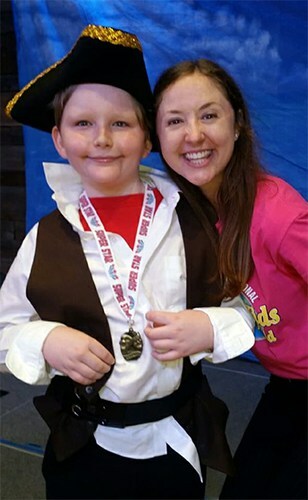 "We are extremely honored and very excited that the Little Rock School District has recognized the amazing benefits that Drama Kids classes offer students ages 4-18, to include public speaking and communication skills, creative thinking skills, collaboration skills, as well as acting skills," said Drama Kids of Pulaski County Director Melissa Diller. "The Henderson students will also have tons of fun while developing higher levels of confidence and self-esteem and building a foundation for personal and professional success." Diller also noted that the Henderson Middle School program was made possible through a generous grant from the Arkansas Arts Council's Arts in Education program. Arts in Education Program Manager Kimberly Davis facilitated the arrangements. Drama Kids International is the largest after-school drama program in the world. There are more than 15,000 students currently enrolled. Drama Kids' copyrighted curriculum features original, creative lessons with a built-in advancing scale of development that enables students of different ages and abilities to progress at their own rate. Its curriculum differs significantly from traditional drama and other after-school programs, with an emphasis on fun drama activities that are designed to allow all students to fully participate and develop acting, speaking, and creative thinking skills. Drama Kids offers age-appropriate classes for students ages 4 through 18 years old. Classes typically meet once each week for one hour at locations throughout the country. The program allows new enrollment throughout the year, space permitting. Drama Kids also offers Drama Kids Preschool Workshops, Drama Kids Summer Camps, and Drama Kids At School, an in-school program for elementary and middles schools that brings its innovative curriculum directly into the schools as part of the school's after-school program. For more information, visit www.dramakids.com. For franchise information visit www.dramakidsfranchises.com.